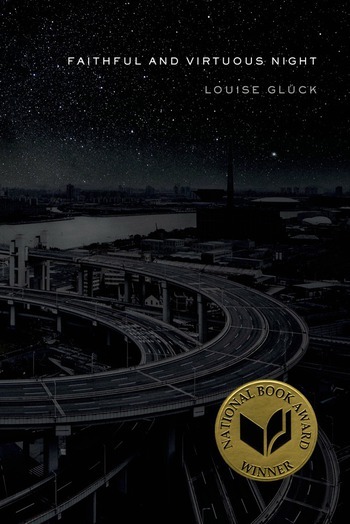 Louise Glück is one of the finest American poets at work today. Her Poems 1962–2012 was hailed as "a major event in this country's literature" in the pages of The New York Times. Every new collection is at once a deepening and a revelation. Faithful and Virtuous Night is no exception. You enter the world of this spellbinding book through one of its many dreamlike portals, and each time you enter it's the same place but it has been arranged differently. You were a woman. You were a man. This is a story of adventure, an encounter with the unknown, a knight's undaunted journey into the kingdom of death; this is a story of the world you've always known, that first primer where "on page three a dog appeared, on page five a ball" and every familiar facet has been made to shimmer like the contours of a dream, "the dog float[ing] into the sky to join the ball." Faithful and Virtuous Night tells a single story but the parts are mutable, the great sweep of its narrative mysterious and fateful, heartbreaking and charged with wonder. Louise Glück is the author of more than a dozen books of poems (Averno, A Village Life) and essay collections (American Originality). Her many awards include the Pulitzer Prize for The Wild Iris, the National Book Award for Poetry for Faithful and Virtuous Night and the National Book Critics Circle Award for The Triumph of Achilles. She teaches at Yale University and lives in Cambridge, Massachusetts.